Would give it five stars if it didn’t repeat the last sentence in the paragraph consistently. LOL! It works fine when reading regular documents, but when I type in a URL, it only reads part of the URL for some reason. With some tweaks this could be a go-to app but a couple of issues limit it to 3 stars for me. 1. There isn’t a share feature from other apps. The primary thing that I want to do is read from web pages and to do so I have to manually copy urls from a browser and paste them into this app. Extra and unnecessary steps but not a deal breaker since it does perform well. 2. If you are reading something lengthy that you won’t be able to finish in one session, you better hope you remember where you stopped because chances are you will have nothing but a blank screen when you try to return to the app. Definitely need a way to save what you are reading to be able to return to it (and also the option to discard when done). 3. 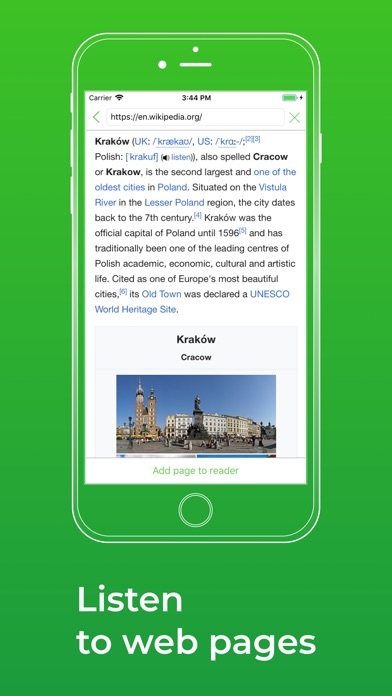 Keeping links active once a page is processed for reading would be very helpful for multi page articles. You do have the option to return to a version of the original page but again, extra and unnecessary step. 4. 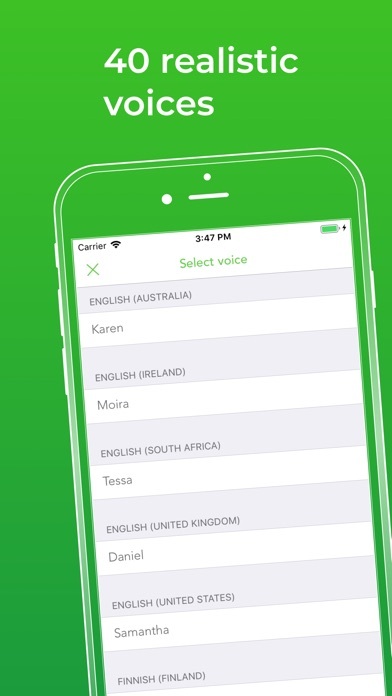 Include an option to “edit” the pronunciation of words and this could easily become a 5 star app. Looking forward to future updates. I’ve been looking for an app to scan and read my college text books. 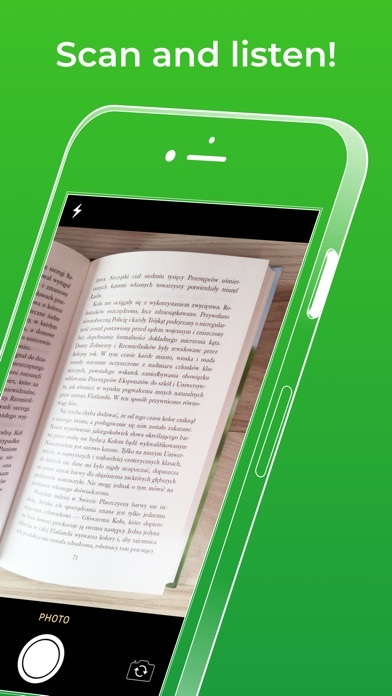 Each book is 600+ pages, this app will save me from the nightmare of reading multiple books. I have one huge dislike that prevents me from using this app. One of my text books is divided into two columns. The left column must be read first then the right column. The voice reader will jump around the page making it difficult to understand anything. Please adjust the voice reader to be compatible with different types of books. I've always loved this app because it is WAY more affordable (and versatile), but it just got even better with the most recent update. The ability to intelligently skip margin notes until the end of page is just what this app needed to go from amazing to practically perfect. Thanks!!! Tested it for 2 minutes, already in love! This is a very useful App, thank’s so much for making it free! Looking forward to test for few days! THANK YOU! 5 STARS! 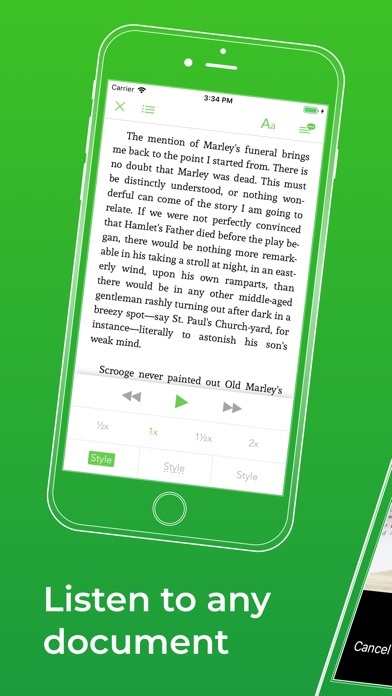 Update: While listening to the reading on the app, I found that it reads the “dots” in the end of a sentence. If a sentence ends with “...” 3 dots, the app would actually read those dots: “dot, dot, dot.” I want to bring your attention to this, so you could maybe fix it. It has lots of voices, but not a lot of functions. No adjustment on reading, background color, etc... Also, Tried to transfer pdf or ePub from other app, the app is not in the Open-in list. Waiting for more improvement.